So when word leaked this week that the company would be unveiling a smaller, cheaper version of its iPad—in typical Apple fashion, at an invite-only presentation in a San Jose auditorium, live-streaming online around the world— the education world took notice. Here are the details. 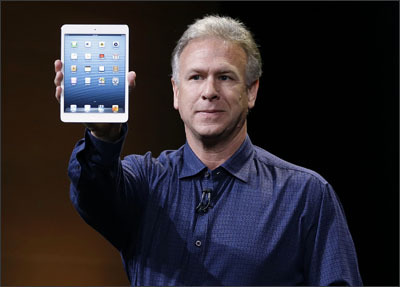 Yes, Apple announced a new “iPad Mini,” a tablet that is 7.2 millimeters wide, 0.68 pounds, and with a 7.8-inch screen. That’s 25 percent thinner, 50 percent lighter, and two inches smaller in screen size than the regular-sized iPad. The iPad Mini is touted as offering the same functions and display as the regular iPad (both have displays of 1024 by 768 pixels; 10-hour battery life) but with more portability. So a digital textbook or learning app will appear the same on an iPad Mini as it does on a regular iPad, Phil Schiller, Apple’s senior vice president of worldwide product marketing, said during the event. Apple also unveiled a new 13-inch MacBook Pro laptop with retina display that starts at $1,700 each, and a new iMac desktop computer that starts at $1,299 and features a “Fusion Drive,” which is a hybrid of flash storage and a hard drive that runs faster than its existing options. The iPad Mini starts at $329 for a Wi-Fi-enabled tablet with 16 gigabytes of memory; a device with Wi-Fi and cellular connectivity, useful for students without Internet at home, starts at $459. Regular iPads for K-12 schools run between $379 and $829, depending on the model and specifications. As much as schools have embraced the iPad, technology specialists have told me the costs of the devices can be prohibitive, especially in the case of 1-to-1 learning environments. Even Cook acknowledged in a July conference call that costs needed to come down for all schools to take advantage of the technology. As a result, other tablet makers have entered the schools market with cheaper devices. Amazon offers a 7-inch Kindle Fire 2 for $149 and recently announced a free tool for teachers and administrators to manage schoolwide Kindle devices. Tablets using Google’s Android operating system are being used in schools as well, some at costs around $200. Barnes and Noble, spurred by a recent $300 million investment from Microsoft, offers a 16-gigabyte Nook Tablet for $249. Datawind, an Indian company, offers a tablet with a 7-inch screen for $40 and, after some early troubles, is selling devices to the Indian government for school use. During Apple’s live event, Cook introduced the iPad Mini by touting its potential for schools. He said 80 percent of the nation’s “core curricula” is available in iBooks, Apple’s digital bookstore. He showed a glowing quote from James Ponce, the superintendent of schools in McAllen, Texas, which recently purchased 25,000 iPads as part of a $20 million digital learning initiative that I wrote about here. There is also a new version of iBooks, which allows people, including teachers and “not just the big three textbook publishers,” Cook pointed out, to author their own textbooks. He highlighted the ability to include math tools and multi-touch widgets within the e-textbooks, though that functionality is available through other e-textbooks providers. But overall, one of the big selling points for iPads in education is that the learning experience is better and less burdensome than print textbooks. There is growing support on a national level for the switch. Earlier this year, the U.S. Department of Education and Federal Communications Commission unveiled a “Digital Textbook Playbook” that encouraged schools to switch to all digital materials by 2017—in a recent report the State Education Technology Directors Association followed that recommendation. But the playbook based the alleged annual cost savings on a tablet that costs $250. And even if the iPad Mini price is more inclusive to schools, Apple may find the reduced specifications problematic for schools. The Smarter Balanced Assessment Consortium (SBAC) and the Partnership for Assessment of Readiness for College and Careers (PARCC), the consortia overseeing the online assessments that are part of the Common Core State Standards, set guidelines that call for a minimum screen size of 9.5 inches for the common assessments. Whether schools opt for devices that are catered toward the assessments remains to be seen. As with most Apple product announcement events, the Internet, especially Twitter, was paying close attention. Here is some education-related reaction to the iPad Mini. Feel free to leave your own in the comments. For years progressive educators have known the textbook was dead. Apple’s latest iPad Mini / iBooks Author event (October 23, 2012) suggests we are closing in on the tipping point that should hasten its demise. I’ll let others critique the viability of the iPad as a textbook replacement in this era of shrinking budgets. Instead I’ll focus on how teaming iBooks Author with the iPad can turn students from passive consumers of information, into active researchers, thinkers, designers and writers. It is Lucia from SJFC. We still refuse to see that we are in the midst of a drastic change. We are going to be obliterated by this new paradigm and we deserve to be. Too bad that kids are the ones that are hurt. In my school, we got 7 iPads Generation 2 from Apple as iPad 3 came out. They are used by groups of 4-5 in Bilingual Chinese history classes so the newest immigrants can learn American history and Global history. Reading in their native language prepares them to learn the same information in English. Without these iPads, the Chinese students would not learn more about selecting good sources either. Seems like a nice tablet. I presume that I would still prefer my Google Nexus 7 but I am clearly biased. As for schools…I think the much better purchase is the chromebook. Cheaper and better for creation. The tablets/ipads are great for consuming media but it is nice to have a full keyboard to create on. I think it is much better for schools, teachers, and students to seek out high quality apps and instructional materials that are device-independent. The delivery mechanism (tablet, laptop, etc.) is nearly irrelevant. Get what you can afford and come as you are. It is NO DIFFERENT than people choosing what smartphone to buy, what car to drive, or what brand of TV to use. Apple makes good products, but what they make even better is hype, and making people believe that they couldn’t possibly live without them.